Big Bear Lodge and Resort cabin rentals, located just off Wears Valley road, provide fast access to downtown Pigeon Forge and Great Smoky Mountain attractions. From the comfort of these luxury cabin rentals and duplexes, you can stay less than a mile away from the fun-filled parkway. This convenient location near the best attractions, shopping and restaurants in the Smokies is bound to be a hit with your family or group. Even better, These rentals are great for trips to Dollywood since the classic theme park is only short distance across town. Big Bear Lodge and Resort cabins are a great place to begin your very own Smoky Mountain adventure! Our vacation rentals in Big Bear Lodge and Resort also come with resort facilities! Whether you visit the Smoky Mountains in the heat of summer or during the snowy winters, your family can enjoy a cabin with indoor and outdoor pool access! There is also a resort community game room for the kids to play in. Adding to this Smoky Mountain resort's convenient location is that the resort is close to a trolley stop! This trolley allows convenient stops through the parkway and saves you the trouble of finding parking for area events and local attractions. Our cabin duplexes in Big Bear Resort come with great in-cabin amenities as well. Enjoy WiFi Internet access, a private game room, fully-equipped kitchen, washer/dryer, and jacuzzi tub for your stay in the Smokies! On top of these comfortable features, your family will love stepping out on cabin porches for lovely mountain views. Save 15% on your cabin rental by booking online! These great vacation savings apply to every Smoky Mountain cabin rental that we offer. Book today and save during your cabin vacation in the Smokies! Looking for luxury accommodations closer to the national park? 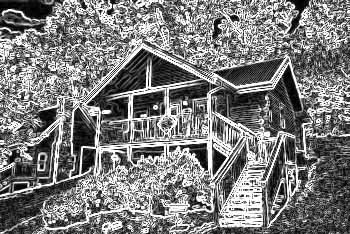 We also offer resort cabins in Gatlinburg, TN that are ideal for enjoying the mountains of Tennessee in comfort and style. Book "Growly Bear," a 2 bedroom cabin near Downtown Pigeon Forge with a hot tub, pool access, and comfortable sleeping space for 9 guests in the Smokies! Come enjoy this Big Bear Resort cabin near Gatlinburg with indoor swimming pool access and an outdoor pool in the summer too! Online Cabin Special!